My theater-savvy friend Victor Nelson asked me a few weeks ago about Sweeney Todd: The Demon Barber of Fleet Street, Tim Burton's film version of the 1979 Stephen Sondheim musical. He wondered if Helena Bonham Carter was up to the vocal challenge of the Mrs. Lovett role. She's excellent, I replied; but aren't you anxious about Johnny Depp as the mad barber? He's not a trained singer. "Oh," Victor said with a knowing laugh, "Johnny Depp can do anything." He can. And she did. And they  Burton, screenwriter John Logan, the whole cast and crew  they've done it. This adaptation of the Hugh Wheeler libretto (from Christopher Bond's play) is both faithful and liberating. The story, of a bitter man in 19th century London who has lost his wife and child and determines to carve out his revenge, has never seemed so human or so bleak. It's no longer just a Guignol songfest, staring at its creatures, with fascination but not pity, from an Olympian distance above the cage in which they claw at one another. Inside this sarcophagus of a play, beneath Sondheim's cold-steel lyrics, Burton finds a pulsing, mournful heart. And then he rips it out. Horror coexists with humanity, once we see the damage of a soul driven mad by a love lost and defiled. There will be blood, plenty of it, cascading, spurting, spuming from the throats of the men unlucky enough to sit in Sweeney's barber chair. And there will be food, for the demon barbershop is just above Mrs. Lovett's pie store. The corpses are filleted, cooked and served to unsuspecting customers. Cannibal canapes, if you will. Yet, Burton takes a purchase on our more elevated emotions by showing the source of Sweeney's rage. Fifteen years earlier he was a sweet young man, named Benjamin Barker. His beloved wife and young daughter were ripped from him by the evil Judge Turpin (Alan Rickman), who exiled him to Australia. So Sweeney is a romantic tragic figure; he has fallen from a great height off the cloud of his belief that love can last forever. Now he knows better, and throws himself into this amorality play. It's man devouring man, vengeance destroying ideals. The director assured some measure of audience sympathy for Sweeney by handing the role to Depp, a magnificent star at the apogee of his powers. Depp's voice may be on the reedy side, but he's a true singing actor, making every note as persuasive as his words and gestures. Sporting an Elsa-Lanchester-as-the-Bride-of-Frankenstein streak of white in his full dark hair, Sweeney is, in a way, the monster created by the Judge's turpitude. Benjamin is effectively dead; Sweeney is his remorseless spirit, the deft hand of fate wielding a razor  shouting, "At last my arm is complete again!"  against the necks of those who deserve to die. And, once he gets in the habit, a few who don't. In the 1979 original, Angela Lansbury played Mrs. Lovett as a deranged kewpie doll, inanely flirtatious toward Sweeney yet heartless toward the human remains she pounded into patties. The wonderful singer-comedienne Judy Kaye, in last year's Broadway revival, saw Lovett as the flip side of Sweeney: they're both killers, but he's in it for retribution, she for the sick fun. Bonham Carter, though, is a figure of crafty scorn, and nearly as misanthropic as her demon lover. Ill fortune has ground him down; for her, it's the long slog of surviving among London's lower and criminal classes. The woman's dreamy side surfaces only in her number "By the Sea," where she envisions a retirement idyll. But her dreams take her only so far: Sweeney frowns through the entire reverie. He'll be a part of no one's fantasies but his own. 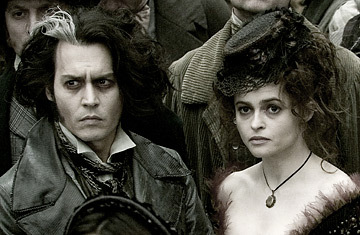 Eventually, Mrs. Lovett's destiny will be the same as Bonham Carter's in the last film she made with her husband: corpse bride. Sweeney Todd might have been written for Burton. It's a festival of his obsessions, set to dissonant music. Batman: a mysterious crusader prowls through the night, administering justice as he sees it. Beetlejuice, the dead (Sweeney and his victims) dwell just above the living (Mrs. Lovett and her customers). Sweeney is a figure of pathos with a sure tonsorial touch: Edward Scissorhands, meet Edward Razorhands. As in so many of his films, and all the ones starring Depp, Burton celebrates oddball outsiders who create their own rules, and often perish by them. The new movie also gives a darker  retrospectively  hue to the seemingly innocuous Charlie and the Chocolate Factory. Same director, same actor, different food supply. Or is it? The Burton film that is closest visually to Sweeney Todd is Sleepy Hollow, the 1999 fable about innocence trapped inside malevolence. The desaturated color scheme of that film, set in 18th century New York City, is here applied to the streets of London a few decades later. But whereas Burton bent an old legend to comic-horror ends, this time he's not kidding. The shadows aren't faux-ominous, they are expressions of the city's pestilence of selfishness and cruelty, where the motives of virtually everyone  both lowlife and high-born  are venal and verminous. In this stricken cityscape, the truly malevolent the Judge and his Beadle (Timothy Spall, that Hogarth cartoon of an actor, here more rodentoid than usual)  find their appropriate end. But so does the merely preening Pirelli, "the barber of kings, the king of barbers," impersonated with gusto by Sacha Baron Cohen. (All those real people Baron Cohen has fooled and mocked in his Ali G. and Borat incarnations may flock to see Pirelli get outsmarted and sliced up.) There is one decent young couple, a mirror of the barber and his wife in their early bliss: Sweeney's daughter Joanna (Jayne Wisener) and her beau Anthony (Jamie Campbell Bower, who looks, somewhat disconcertingly, like Scarlett Johansson, and sings with a robust tenderness). Do they escape the carnage? We won't say; and at the end, the film doesn't show, so intent is Burton on following Sweeney to his doom. As the bodies pile up  and land with a sickening squishiness when they slide down the chute from Sweeney's parlor to the basement the more sensitive may avert their eyes and turn from the movie. But this is gore with an agenda. Having seen where Sweeney came from, and the artistry Burton and Depp bring to his tale, we must keep watching. Horror has its own panache, its internal, infernal beauty. And nothing we see is as terrifying as the scar's on Benjamin Barker's soul when he devolved into Sweeney Todd. A final word for those of you who just don't care for musicals: The movie's true lyricism is less in its score than in its visual and emotional palette, and in watching Depp rise to the majesty of madness. So give Sweeney Todd a try. Even Victor, when he finally saw it, agreed: it's bloody great.